This post originally appeared on Satellite Sentinel Project. 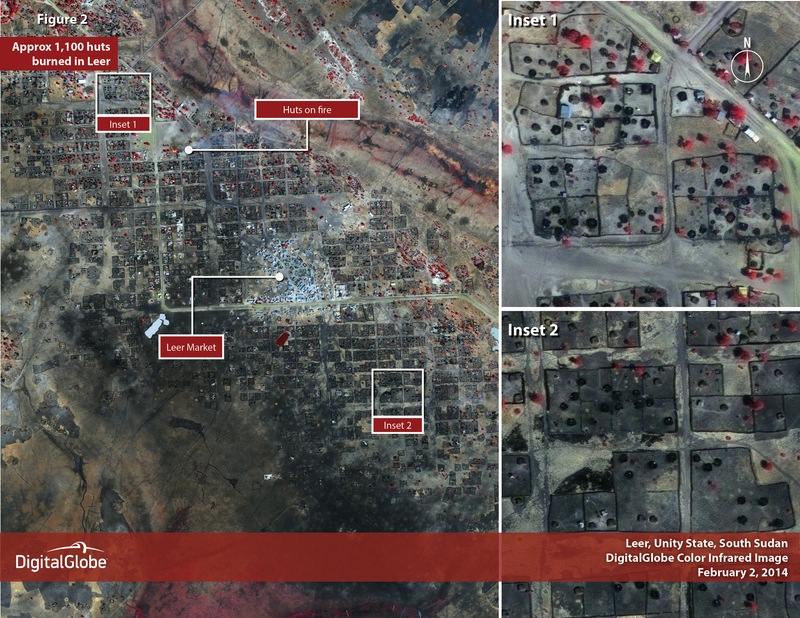 New DigitalGlobe satellite images acquired on February 2, 2014 confirm at least one violation of the cessation of hostilities agreement signed by South Sudan's combatant forces less than two weeks ago. Imagery of Leer town in Unity state, which journalists and aid workers have been unable to visit since the latest bout of violence, shows huts engulfed in flames. At least four active fires were visible in Leer at the time that DigitalGlobe satellites imaged the town on February 2, 2014. Speaking by satellite phone to the Sudan Tribune, Tang Both, a resident of Leer, said he was forced to run into the bush due to the attack. "As [I] am talking now we are on [the] run, because this morning our area went under fire from government soldiers. We were forced out" he said, adding that "many children and women […] died while trying to cross [the] river […] for safety." 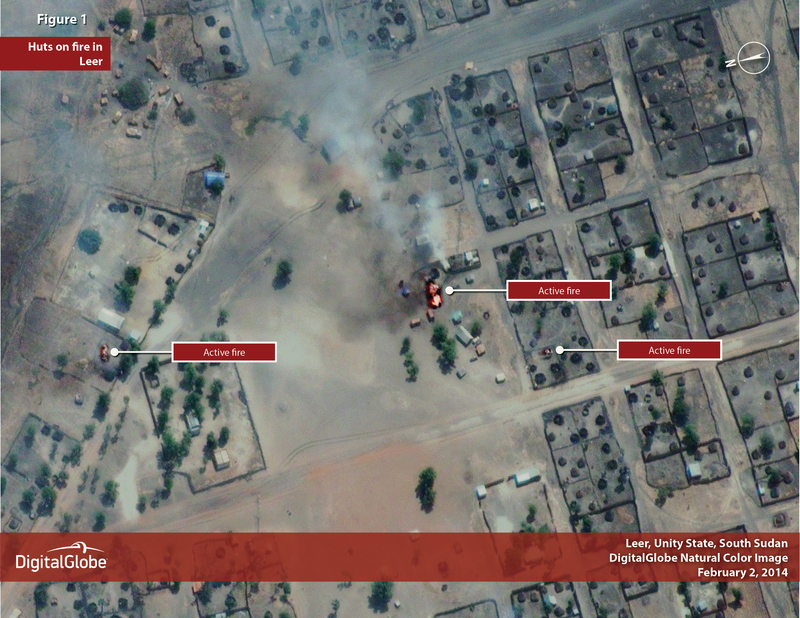 Although the Satellite Sentinel Project cannot determine if the forces that attacked Leer were government soldiers or government aligned militias, confidential sources do confirm the attack itself. According to the United Nations, 188,100 people were already displaced in Unity state as of January 31, 2014. This latest attack will only increase those numbers. Leer is the home town of South Sudanese “resistance” leader and former Vice President Riek Machar, who recently re-confirmed his continued opposition to the South Sudanese government led by President Salva Kiir. 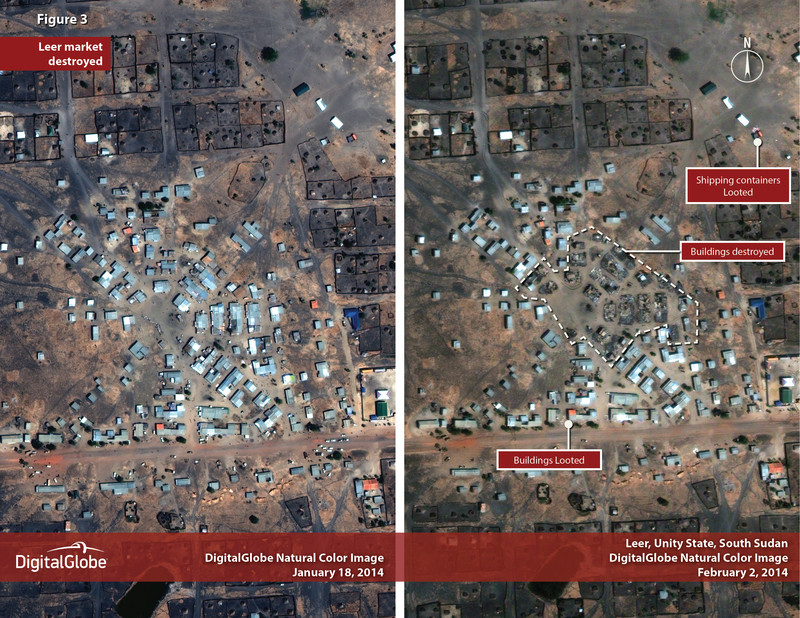 Satellite Sentinel Project's, or SSP, analysis of imagery taken on February 2 found evidence of intentional damage and destruction of civilian structures in the town. DigitalGlobe Analytics counted almost 1,100 residential huts burned to the ground. Brig. Lul Ruai Koang, a spokesman for Machar’s Sudan People’s Liberation Movement/Army In Opposition, told Voice of America that a combined force of Justice and Equality Movement, or JEM, and South Sudan Liberation Army, or SSLA, militias advanced on Leer over the weekend. The SSLA, who accepted President Kiir's offer of amnesty and integration, have been openly fighting alongside the South Sudanese government during the latest round of hostilities. Reports of JEM's involvement have been heavily disputed. Much of the South Sudanese army in Unity state defected from the government and aligned themselves with Machar’s opposition forces in December 2013. The humanitarian organization Médicins Sans Frontières, or MSF, evacuated 240 staff members from Leer on January 31, before the latest bout of fighting began. MSF staff took several dozen of the most vulnerable patients from the hospital with them to the bush in an effort to continue providing care to them. Those staff are still hiding in the bush and have limited medical supplies, according to Enough Project sources. MSF head of mission Raphael Gorgeu warned that the hospital’s closure has left 270,000 people without access to healthcare since the southern part of Unity state is now without an operational hospital. Satellite images of the central market showed 17 destroyed market stall buildings and indications of looting. The U.N. estimates that at least 863,000 people have been displaced by the recent violence in South Sudan, of which 123,400 have fled to neighboring countries as refugees. 3.2 million people are at immediate risk of food insecurity, and more than 90 percent of them are in states that are most affected by the recent conflict and violence. View or download the high-resolution images.